Sports Costs > How Much Do Taekwondo Classes Cost? How Much Do Taekwondo Classes Cost? Taekwondo is another term for a modern Korean martial art, meaning foot, fist and art. The cost of these lessons is going to vary according to the location, the teacher performing the class, the level of the student and number of classes taken. 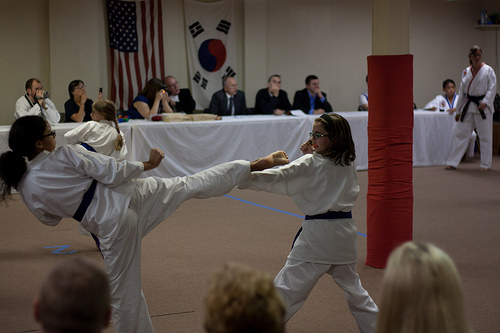 The average monthly fee for taekwondo classes is anywhere from $50 to $200 per month for about three classes per week. On average, each class is going to take up to an hour, and classes can range anywhere from 10 to 25 members at once. For example, the Clato Day’s Tae Kwon Do School in Connecticut charges $64 a month for their classes. At Pai’s Taekwondo, a popular option for those living in New York, pay about $150 for a one month VIP trial session. Private lessons one on one through an instructor can cost anywhere from $35 to $75 per 60-minute lesson. According to a forum thread over at DCUrbanMom.com, members claimed that it could cost anywhere from $130 to as little as $70 per every four weeks. It was also noted that the geographical location will greatly affect the price. Members on Reddit.com said they paid anywhere from $190 for the first month to as little as $150 per month. Most centers will require a uniform, belt, belt stretchers and shoes. Sparring gear, such as gloves and shin pads should be purchased at first, and as the student progresses, more gear may have to be purchased. Traditional Taekwondo will use a white uniform, referred to as a dobok — a uniform that symbolizes purity and perfection the students are expected to strive for. Classes will range anywhere from 45 minutes to 1 hour, and during this time, students will learn self-defense techniques as well as the curriculum associated with Taekwondo: philosophy, the basics, forms, self-defense, sparring, meditation, leadership skills and fitness. All classes will be based on the student’s skill level and will be taught by certified black belt instructors on a step-by-step basis. Children’s classes will be about 30 minutes. A one-time registration fee can cost anywhere from $20 to $100. If you sign up for a school that charges membership fees, this fee may be renewed every year, depending on the school’s policy. Belt tests and flags can cost anywhere from $15 to as much as $55. Students start out with a white belt and can grow to a yellow, green, blue, red and black. With above average physical, mental and emotional strength, students can graduate to a black belt in as little as three years. As mentioned earlier, if the center requires you purchase the uniform, belt, stretcher and shoes, this could be another $200 to get started. Most centers may allow you to start in a pair of comfortable shorts or pants. As the lessons progress, some weapons may need to be purchased, depending on the school, such as eskrima sticks, sai knives, nunchucks, a bo staff, kama knives and/or sword. Taekwondo testing fees, as a student graduates to another level, should cost about $35 to $150, depending on the school. Participating in tournaments can be an additional cost to think about. There’s no need to ever sign a contract with a school, so if the school forces a contract, you may want to think twice. According to TKD-hapkido.com, this is just a ploy to make more money and focus on profits, not its students. Children older than three to four can generally start training and taekwondo classes for toddlers usually don’t exist. Some training centers may offer combined classes where the parent can be involved. With the desire to learn, no experience is necessary if you want to learn the art. Be wary of any school that claims you can get your black belt in as little as a year with minimal training. These schools are often referred to as “belt schools” and they are usually in it for the money. Talk with different training centers about their offers on taekwondo classes and compare it with the other centers in order to know if which one offers the best yet most affordable training. Many centers in the area will have their prices listed right on their website. If not, a quick call should give you an idea of what it should cost. It’s not uncommon to find a school that offers a free class, and if you’re able to find this free class, try to take advantage and see if it’s something that you’re comfortable with. Many offer discounts if you refer a family member or friend. Check the official website, social media or local mailers for coupons or promotions currently going on that you can take advantage of. Purchasing sessions in bulk can bring down the costs, often by as much as 30 percent. However, if you were to consider purchasing in bulk, highly consider doing so only when you have been taking classes for a few months and know for certain you want to continue. If you go this route, most schools will make you sign a contract in order to receive the discount. While it shouldn’t be considered the same, “free” lessons can be found throughout various videos on YouTube. If you have to purchase gear, buying used sparring gear may save you 30 to 50 percent.